Introducing GoCart, our new professional shopping service. Our professional shoppers will shop your order like YOU would, selecting items based on your preferences. 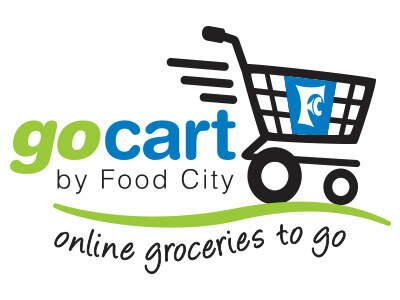 Simply shop Online at FoodCity.com, from thousands of items available in your Food City store and select a pick-up time. Our professional GoCart Shoppers will have your order ready to load into your car when you arrive. No need to get out of your vehicle. Now that's convenient! If you already have a FoodCity.com account select "login" at the top of the page and sign in using your valid email address and password. For new accounts: Register online by clicking "register" at the top of FoodCity.com. Submit your email address in the provided space and we will send you a verification email to get started. Once you have logged in, please go to “Store Finder” to select the GoCart location nearest to you as your home store. The quickest way to locate a GoCart location within the store finder is to search by zip code. 1.) The easiest way to shop is to click on the Quick Cart button on the top right of the page and shop from a list of the items you’ve purchased in the past 90 days. 2.) Search for individual items in the search field. 3.) Shop from the grid view of the weekly ad. Save even more money while you shop, with our digital coupons. As soon as you select your first item you will be prompted to select a day and time to pick-up your order. Available pickup times for same day service start 3 hours from the time you place your order. 5. Review your order and submit. When you’ve completed your cart order, review your order and make changes as needed. You can also let us know if you’ll allow substitutions should we be out of an item that you’ve selected. No worries, we’ll always let you know ahead of time what other choices are available. If you have additional special requests for your professional shopper, please enter them in the comments area on the cart summary page. Choose Pay Online or Pay In-store when checking out. Please note that the name on the order must match the name on the ValuCard FoodCity.com account. At your selected pick-up time, pull up curbside at the store (look for the sign). If you selected "Pay In-store" we will swipe your credit or debit card using a portable credit card machine, keeping your card in your possession at all times. No additional fee, no need to leave your car. Our professional shopper will load your groceries into your car and you’re on your way. Easy!